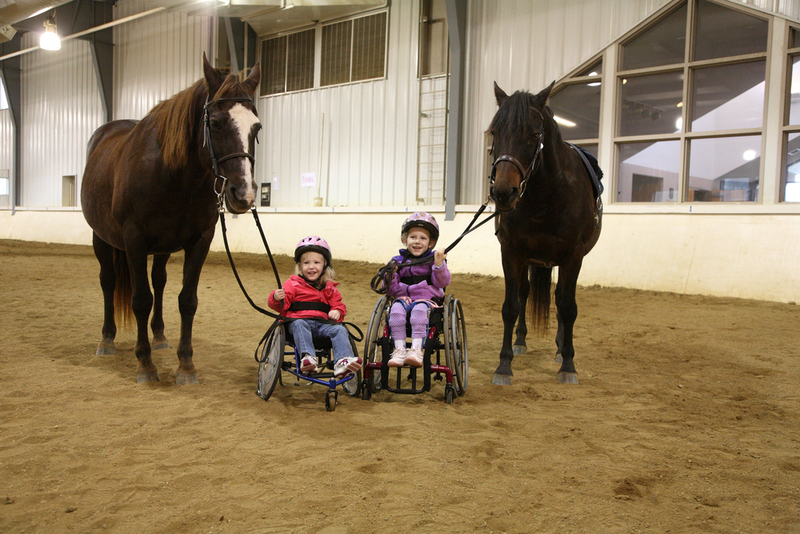 Hippotherapy (Horse Therapy) — I Can & I Will! Today was a beautiful day so the girls got to do their hippotherapy outside! The leaves are starting to change colors! Brooke had her first evaluation and riding session today at the Cheff Center! After 1 year of watching her big sister take riding lessons it was finally her turn! She was so excited to get going and didn’t want to wait around for her assessment; she knew what she was there to do! She’s heard about Brielle’s favorite horse “Ella” for the past year, so when I asked her what horse she wanted to ride on our way there, she responded with, “Ella!” So to her surprise, they had Ella saddled up and ready for her to ride. After a little bit of introduction between Brooke and Ella, they were off and Brooke had the biggest smile! During her session she was even saying, “run, run, run!” But they didn’t get that far this time. :) She rode Ella for a solid 20 minutes and she was physically worn out. Hippotherapy gives the same stimulus to the rider as walking, so those 20 minutes were like Brooke walking for 20 minutes! After she was done riding, she gave all her helpers high fives and gave a big hug to Ella the horse. Brielle and Brooke brought carrots to give their horses a treat after their sessions. I think that is just as much fun for the girls, they love going back into the barn and seeing where the horses live too! Hippotherapy is such a great way to get some extra therapy in if you ask me! I think Brooke is going to love horses just as much as her big sister!